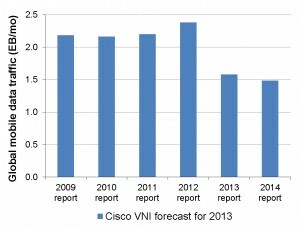 Today Cisco helpfully tweeted out one of the key statistics from their upcoming VNI report, which is scheduled for release on Feb 5, indicating that the “annual run rate” for mobile data traffic in 2013 was “less than 18 exabytes.” That’s even lower than last year’s report which forecast total traffic of 1.58EB/mo at the end of 2013. 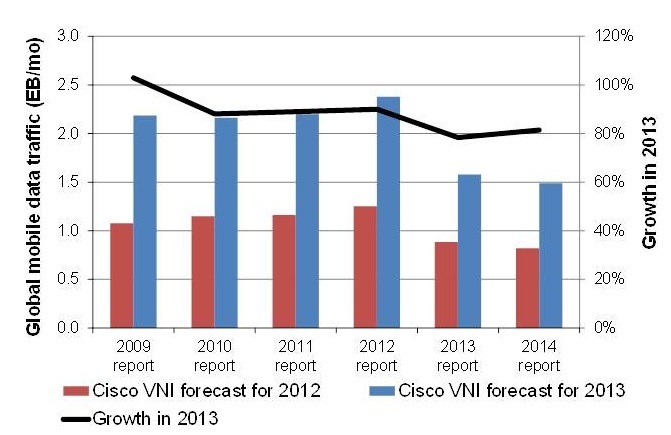 So I thought it would be interesting to examine how Cisco’s projection of global mobile data traffic for 2013 has evolved over the last six years of VNI reports. 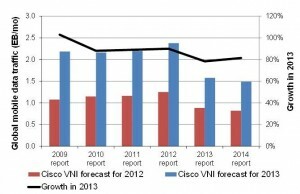 The new figure also suggests that unless Cisco retrospectively reduced its estimate of global traffic in 2012 (which happened last year), then global traffic growth was only ~68% in 2013, rather than the 78% growth that Cisco forecasted in February 2013. Looking out to 2018, where an annual run rate of 190EB (i.e. monthly traffic of 15.8EB) is indicated, that would compare to a February 2013 projection for monthly traffic of 11.2EB at the end of 2017, or 42% growth in 2018 if the 2017 figure remained unchanged (in fact it may also come down slightly). Sadly, we don’t have any CTIA benchmarks for traffic growth in the US in the first half of 2013, as that survey has been converted from a six monthly analysis to an annual effort, but its interesting to contrast these numbers with Chetan Sharma’s recent report suggesting that usage per consumer grew from 690MB to 1.2GB each month in the US in 2013 (74% growth) and from 140MB to 240MB per month globally (71% growth). Sharma’s numbers seem to be a little on the high side because obviously the number of smartphone users grew significantly during the year and there is tablet traffic to add in as well. One possibility is that Cisco is assuming there was little or no growth in laptop data traffic, which accounted for 46% of mobile data traffic in 2012 according to its February 2013 report. We’ll obviously find out more next week, but it seems that despite evidence consumers are using more data on their smartphones when they upgrade to LTE, mobile data traffic growth worldwide is still slowing rather more rapidly than Cisco previously expected. 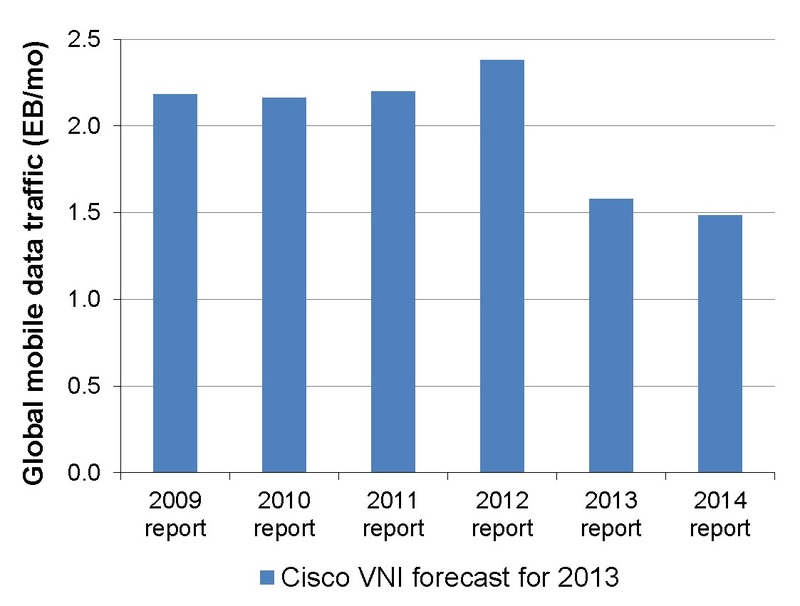 UPDATE (2/5): The released Cisco figures confirmed that traffic in 2012 is now estimated at 820PB/month, increasing by 81% to 1488PB/month in 2013. This represents a retrospective reduction of 7.3% in the 2012 estimate and 5.7% in the 2013 estimate. The trend for 2012, 2013 and growth between 2012 and 2013 is shown below. Although some guesswork is still required, today’s activity pretty much confirmed my view about where we stand with the H-block auction. In particular, I’m still convinced that there have been no significant bidders other than DISH since Round 1 and now there is no-one else left in the auction with more than a few million bidding units of eligibility at most. As a result, the auction should be completed, with DISH paying the minimum amount of $1.564B, by the end of this week or very early next. Tomorrow or so we might still see the odd competing bid here and there, if one or two bidders jump into the few remaining blocks that have not yet received any bids, in order to preserve their remaining eligibility. However, DISH has made it very obvious to rivals that it will simply keep pushing up the price of licenses that receive competing bids (even raising its own winning bid) until any other bidder gives up. Moreover, in Rounds 16 and 17 there were no longer any competing bids whatsoever in the auction. The table below shows the decline in the number of competing bids and how the last few remaining competitors switched to low priced licenses in the earlier rounds today, prior to stopping further bids. As I noted yesterday, it looks like someone other than DISH (probably a financial speculator) put in bids for NY and LA in Round 1, but then seeing how little competition there was, gave up on any more bidding. That’s logical, because unless there is a critical mass of other bidders, DISH can simply target its firepower on any smaller bidder until that player stops bidding (or is prepared to pay $0.50/MHzPOP plus for its target licenses). Thus, by sometime tomorrow morning, it looks like no other players will have any remaining eligibility and it will be left to DISH to raise the price step by step to the $1.564B minimum price and the auction will be done. Indeed that seems to already be happening, with DISH renewing its bidding on NY and LA in Round 17 as any potential competition ebbed away. Then we will be able to move on to renewed speculation about DISH’s plans, and whether a deal with Sprint will be announced soon. After all, leasing the H-block to Sprint as part of that deal would be an entirely logical path for DISH to take. UPDATE (1/29): Today’s bidding threw up a few more medium-sized licenses that had been held by other bidders since the early rounds of the auction, notably in Minneapolis and Las Vegas, which DISH turned its attention to after bidding up NY & LA in Rounds 17 and 18 and Boston, DC, Chicago, Dallas and SF in Rounds 19 and 20. The sequence of bids in these licenses is not incompatible with DISH and one other player bidding actively against one another, as some other commentators have suggested is the case. However, that would not be aligned with DISH’s signaling strategy in other licenses (of overbidding its own winning bid, until competitors got the message and gave up, seen in the chart as a yellow cell followed by one or more green cells) and would also require the competing bidder to have won both NY and LA in the first round (only 25% probability, due to the random allocation of licenses between equal bids). Many may now wonder if DISH’s spectrum (and that held by others such as LightSquared) should be revalued downwards, because of the low price of the H-block. That’s not unexpected (and indeed exactly what I predicted last month), but in my view DISH’s real asset value is in its potential “towers” (i.e. satellite TV antennas) not in the spectrum itself. 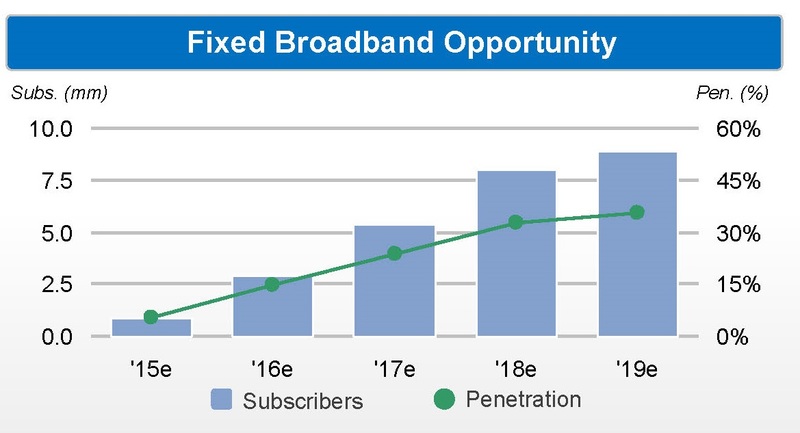 DISH’s spectrum holdings may no longer be worth $10B, but if DISH can monetize its antennas (say 1M sites at $100/month) via a fixed broadband network deployment, then there is a very clear alternative source for $10B in incremental value. No, not LightSquared, although a renewed auction, with no contingencies associated with FCC approval, does now seem like the most plausible way forward for the company. The big issue is then whether Ergen/SPSO’s debt holding are subordinated as a result of the recent trial: if he is then it might not require much more than a $1.2B credit bid for the debtholders to take control of the company, although in those circumstances I’d still expect Ergen to come back with a rival (personal) bid for the assets so that he doesn’t lose his $700M investment. However, if there is no subordination, then we may not see anyone outbidding Ergen even at a price of $1.5B-$2B (which would not repay the secured debtholders in full). Actually I’m more interested in the lack of competitive bidding in the H-block auction, which slowed even further today. So far, after Round 12, only $456M has been bid for the licenses on offer, or less than 30% of DISH’s minimum bid commitment of $1564M. The bidding is anonymous, so its hard to tell whether two different bidders are bidding in turn for many of the licenses or if DISH is bidding against itself in order to reach the minimum commitment. However, the evidence now points increasingly to it being the latter situation, after bidding on the New York and Los Angeles licenses (which had accounted for $216.5M or 56% of the total bids) stopped at the end of Round 8. Then bidding resumed on several other large cities, including Boston, Washington, Chicago, Dallas, San Francisco, which had seen no bids since Round 1. The coordinated nature of this switching could mean that DISH faces a single large opponent, who ceased bidding on New York and Los Angeles and used its eligibility to bid for these other cities instead. Instead, it seems more likely that DISH has been bidding against itself since the early rounds of the auction, because DISH has committed to bid $0.50/MHzPOP on average across the country and the bids have only reached $0.51 in New York and $0.41 in Los Angeles. Obviously any opponent would have had to have been prepared to bid rather more than $0.50/MHzPOP to win the licenses in NY or LA, and even if the objective of a DISH opponent was actually to pick up less expensive licenses in other cities, it would have been necessary to force DISH to bid more than $0.50/MHzPOP in NY and LA so that DISH could reach its committed minimum bid threshold without owning all of the licenses nationwide. If we look at all of the 24 licenses that have attracted competing bids at any stage during the auction, as shown in the chart below, we can see that virtually all of the competitive bidding has been confined to a few small areas, notably in Colorado, Nebraska, Wyoming, Idaho and Utah, where 10 licenses (including Denver and Salt Lake City) have seen multiple bids. There has also been another smaller cluster of activity in Virginia, North Carolina and West Virginia. It is particularly notable that DISH appears to have been deterring any rival bids through multiple rounds of incremental bidding, regardless of whether it holds the license (which is randomly assigned between equal competing bids), until any competitors have demonstrably given up, as seen in the repeated rounds of multiple bids (note competitors with no minimum bid requirement would not overbid themselves, but DISH would be happy to do that while it remains below the minimum bidding threshold). My suspicion is that the same factor may have been in play in New York and Los Angeles, where a token competitive bid was mounted in the first round, and then DISH’s one or more major rival(s) dropped out of the auction, leaving only a handful of small regional players to fight a doomed battle with DISH over a few insignificant licenses like North Platte and Scottsbluff, NE. If that were not the case, then we would again have seen DISH make overbids when it held the NY or LA license itself and that would have manifested itself in two competing bids being made for these licenses if a competitor were present. The fact that no competing bids were offered in NY and LA after Round 1 strongly suggests that no competitors were bidding against DISH for these licenses after that point. Even more significant than the slowing increase in overall bids (where the determining factor is clearly DISH bidding against itself), the increase in total bids for once contested licenses today has been only $1M-$2M per round, demonstrating that virtually no-one is still fighting against DISH. DISH therefore appears well set to capture all of the H-block licenses in the country that it wants, as it has enough spare eligibility to bid for all of these licenses (including those still held by the FCC) for many rounds to come. The fact that the FCC has now increased the pace of the auction to 5 rounds per day, starting Tuesday, also supports the view that DISH is the only bidder for most licenses and most other participants have dropped out. Taking a wider view, many commentators will undoubtedly try and explain away the results of the H-block auction as an aberration, due to the lack of major competitors for DISH. However, even if you accept that view (and ignore the fact that an unprecedented amount of spectrum is being made available through auctions this year and next, which is likely to change the balance of demand and supply significantly), it still doesn’t give much comfort to those who believe that spectrum is a scarce, appreciating asset. After all, this auction has demonstrated that if, like LightSquared, you don’t have many buyers for your spectrum, you’re not going to be able to realize a high price for that asset. That’s particularly important in view of a Bloomberg article earlier this month which indicated that “The Transportation Department, whose concerns that the LightSquared network could affect airliner navigation helped kill the company’s original plan, is withholding assent from the Interdepartment Radio Advisory Committee.” So in effect, the FCC is saying that if the DoT/FAA veto is maintained (and remember they would have to walk back the prediction that LightSquared’s operations could cause 800 deaths), it will not approve LightSquared’s application. This intervention potentially throws the LightSquared bankruptcy into chaos, and could leave Judge Chapman in a near impossible position, because as the FCC emphasized “Under the Revised Second Amended Plan, if the Effective Date has not occurred on or before December 31, 2014, the Plan shall be null and void.” We’ve already had DISH withdraw its bid, and as I noted the other day, it looks very much like DISH has alternative deals in mind. Commitments were also due on the LightSquared exit financing on Friday, and the FCC’s intervention could make the status of that financing even more uncertain. So the question now is whether there is any feasible plan for Judge Chapman to confirm at this point in time? If she decides there is not, perhaps she could order the company to resume the auction of assets, this time without any conditionality on FCC approval. Would that mean Ergen jumping back in with a personal bid at a lower price? After all he suggested on Monday that had been a possibility, backed by a loan against his stake in EchoStar. Would the other LP debtholders compete against him (and put up cash to buy him out) if they weren’t going to get paid off at par plus accrued interest as they expected a few days ago? 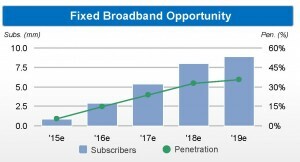 Worryingly for LightSquared’s own reorganization plan, if the FCC intervention, which few expected at this point in time, is regarded as a direct smackdown in response to Falcone’s comments in court, that again raises the question of how big a “Phil risk premium” needs to be attached to the regulatory process, if Falcone maintains a substantial ownership stake in the company (even if he is no longer involved on a day-to-day basis, which seems to be the intent of the Fortress-backed plan). After all, Senator Grassley (who has been a vocal critic of how “the FCC nearly granted billions of dollars in taxpayer assets to someone accused by our nation’s financial regulator of having ‘victimized’ ‘clients and market participants alike’ and leading a ‘graduate school course in how to operate a hedge fund unlawfully’”) was only too happy to give a statement for Bloomberg’s recent story about the lack of progress in Washington, and I’m sure that he won’t remain silent about any future FCC approvals while Phil remains involved with LightSquared.